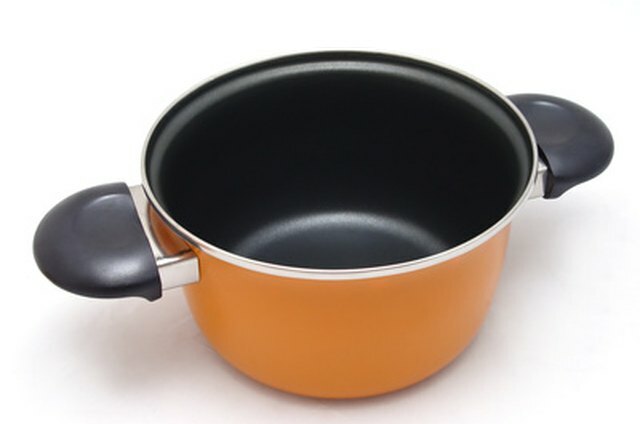 You can completely remove the nonstick coating from cookware, leaving a smooth, clean surface. The look and usefulness of a worn out nonstick pot can be restored without damaging the surface below. 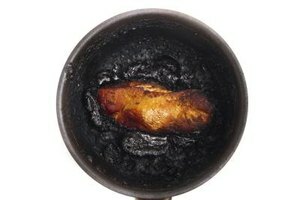 Flecks of nonstick coating peel away from well used nonstick cookware, causing foods to release unevenly. These tiny pieces of plastic polymer often end up in the finished dish. 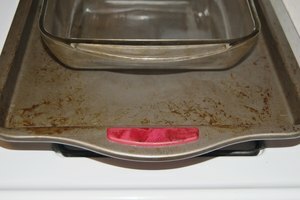 Protect the people who eat at your house from unexpected bits of nonstick material in their food by cleaning it from your pan permanently. Place the nonstick cookware in the bottom of the sink, and pour a half-inch layer of dishwasher soap directly onto the coated surface. Dump a large pot of boiling water onto the cookware until it is completely submerged, and allow it to soak overnight. Lift the cookware from the soapy soak and sprinkle baking soda onto the nonstick surfaces until you no longer see them. Scrub in a circular motion with a heavy-duty scouring pad using firm pressure to release the softened nonstick coating. Sprinkle more baking soda on the surface to augment the abrasion of the scouring pad and remove the nonstick polymer. Wear thick rubber gloves and eye protection as you apply a thick layer of gel drain opener to the remaining nonstick coating. Place the cookware in a well-ventilated area, and allow it to soak in the lye-based cleaner for at least 48 hours. Warn children and keep pets away from the soaking cookware to avoid injury. Put on the gloves and goggles to avoid skin and eye irritation. Rinse the gel from the pan, and use a heavy-duty scouring pad to wipe out the nonstick coating. The nonstick coating should now be gone. Clean the cookware with liquid dish soap and a soft sponge before cooking food in it again. Nonstick coating can also be blasted off cookware using a relatively soft blasting medium like walnut shells and baking soda. Call local sandblasting companies to see if they offer this service. But it is probably cheaper to buy a new, uncoated pan. Using harsh abrasives will scratch the surface of the cookware and make it difficult to lift out cooked foods. The New York Times: Teflon Is Great for Politicians, But Is It Safe for Regular People? What Does Hard Anodized Mean in Cookware?